The Eventurus Hunt 2.0-The Biggest Treasure Hunt in Mumbai will be held on Feb 24 at Tea Villa Cafe. 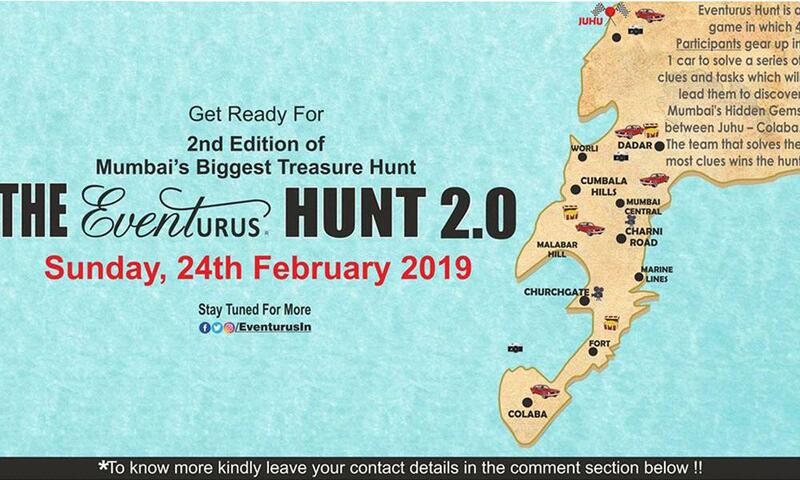 The Eventurus Hunt 2.0 - The Biggest Treasure Hunt in Mumbai Eventurus has come up with its 2nd Edition The Eventurus Hunt 2.0. Register yourself to be a part of the biggest Treasure Hunt In Mumbai !! Eventurus Hunt is a game in which 4 Participants gear up in 1 car to solve a series of clues and tasks which will lead them to discover Mumbai’s Hidden Gems between Juhu - Colaba. The team that solves the most clues wins the hunt. Date : 24th Feb 2019 Time : From 9.30 am 2 pm Venue : Tea Villa Cafe - Juhu, Mumbai Entry Fees: Rs 2499/- Per Team.